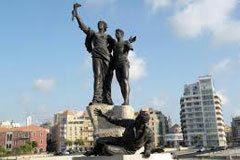 It is a square in the heart of downtown Beirut recognized by its central statue commemorates Lebanese nationalists who were hanged during World War I under ottoman rule. In the 19th century, the square was known as Place des Canons. 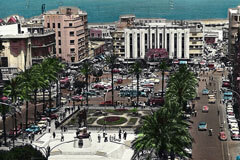 During World War I, Lebanon was under Ottoman rule. In 1915, Lebanon suffered from a food shortage due to Ottoman Turks confiscating food from the local population, swarms of locust invading the country, and western blockade by the Allies, intended to starve the Turks out. A revolt against the Turks broke out which resulted in hanging of many intellectuals and nationalists on 6 May 1916 in the renamed Martyrs' Square. Among them were Said akl, (not the martyr and the modern day poet), Father Joseph Hayek, Abdul Karim al-Khalil, Abed al-Wahab al-Inglizi, Joseph Bishara Hani, Mohammad and Mahmoud Mahmassani, Omar Hamad, Philip and Farid el-Khazen, and Sheikh Ahmad Tabbara. The statue, which was inaugurated on March 6, 1960, is the work of Italian sculptor Renato Marino Mazzacurati. 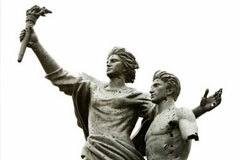 The statue, riddled with bullet holes, has become a symbol for all that was destroyed during the Lebanese Civil War.